This first thing I thought when I saw Sarah was “Wow!”. Clean faced, hair pulled back, wearing a tank and leggings – she was waiting for her make-up to get done and she was stunning. Lauren from Lips n Lashes did a wonderful job enhancing her natural beauty and listening to her when she described exactly how she would like her make-up done. We drove to McMaster University for their portrait session, a place I have wanted to shoot at since I moved to Hamilton. They brought along with dog Blue, who coincidently is the same mixed breed as my fur-baby, I instantly fell in love with her sweet personality! Geesh, seriously. How gorgeous is this mama-to-be?! Sarah and Scott will meet their little one in September. I can’t wait to photograph their little family again when the baby arrives!! A few months ago Allie’s mom posted this photograph on Instagram and I instantly knew I wanted to recreate it. I loved the carefree vibe I got from the image – running through the grass barefoot. Ahhhh, summer. After planning and rescheduling for the perfect sunny day, this was the result! I captured some other portraits of Allie while we were at her Grandmother’s, I love the effect that the bugs have in this image! Allie’s smile is so contagious, I just love this little girl! While I enjoy the portraits of Allie in the grass, the following photographs are my favourite from the session. This wild child is always on the move, so when I was looking through the photographs afterwards and found this portrait of Allie sitting (on the door of an old outhouse of all things!) and looking perfectly at the camera I knew that it was “the photograph” from the session. At their Christmas session I took some great portraits of Ryan, Allie’s brother. They are some of my favourites that I have ever taken and they match perfectly with Allie’s new portraits. I hope mom and dad hang at least one combination of the photographs together! These kids won the gene pool lottery! Seriously though, look at those faces!! My brother and sister-in-law were dogsitting this ol’ girl while their friends were away for the weekend. When they asked if I could capture a few portraits to surprise their friends with, I was happy to help! I’m so glad I could capture a few portraits of Miss Bailey for her family! Whether you know me and are afraid to ask “how much” or you want to know without the hassle of waiting for an email – I have good news! All my pricing is now on my website! Visit my website lizczinegephotography.ca, go to the Contact section and download the informational PDF’s for maternity, newborn or child & family portraits. Each PDF has information about what to expect, how to book, testimonials and they give you an idea of the investment you will be making. With their magazine style layout they’re really easy to read, plus they’re full of really pretty photographs to guide you through! If you are interested in booking a portrait session with me, email me at liz.czinege@gmail.com. I would love to chat with you! This one is my own fur baby. He’s a Blue Heeler/Sheperd cross, and he is scared of just about everything. Ears back, looking completely terrified – this captures Jake perfectly, I wouldn’t want these photographs any other way! 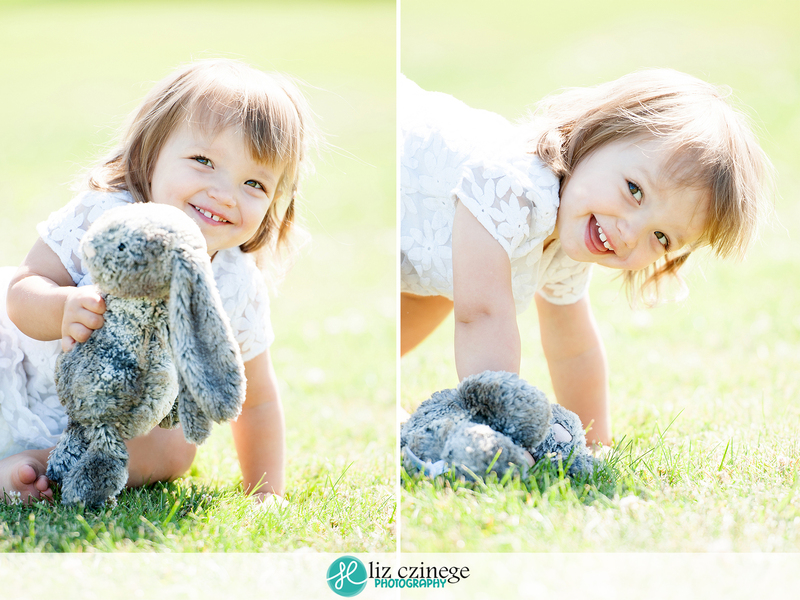 I have been photographing quite a few 3 month old girls in the last month, but every one is so different! I just love Isabella’s smile, it’s so contagious! I honestly can not believe that it had been three months since I captured Isabella’s newborn portraits, time flies way too quickly! Isabella gets this seriously face from her Dad, it makes me laugh! So adorable! How sweet is this face – geesh! Way too adorable! Only three more months until I photographer her again. I’m sure it’ll come quickly, I can’t wait to see how much she has changed!